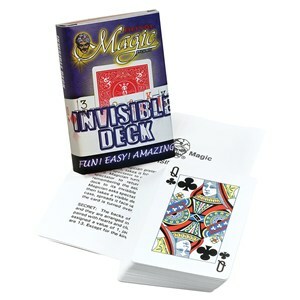 The magician takes "two" decks from his pocket and sets them on the table - one deck is real and one deck is invisible. A spectator is asked by the magician to pick any card from the imaginary invisible deck giving them a completely free choice. The magician then asks the spectator to name outloud the card they chose. The visible deck is then removed from the box and spread out face up to reveal one face down card in the face up deck. When the card is turned over, it is the freely selected card. An amazing, easy to perform miracle that has been performed on television and is a must for any performer! One of the best-selling magic tricks of all time. Available printed on Royal stock or Bicycle stock and in red or blue backs. Please specify when ordering. Each deck is packed with a full-color wrapper and complete instructions.